Governor Obiano has won all 21 local governments in Anambra to return as the state governor. Governor Willie Obiano has won the 2017 Anambra gubernatorial elections. 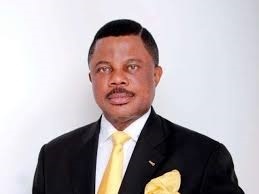 Obiano knocked out fellow contestants Dr Tony Nwoye (APC) and Oseloka Obaze (PDP) in all 21 Local Government Areas (LGA) of Anambra state in a landslide victory which will see him return as governor. Bounce News has confirmed that this is the first time a candidate will win in all the Local Government Areas in the history of Anambra state. Chief Returning Officer, Prof Zana Akpagu announced the final result at INEC headquarters, Awka. While the elections have been largely adjudged free and fair, there were cases of over-voting noted in some communities in Orumba South, leading to cancellation of results in 4 polling units. This was also the case in Aguata LGA where results were cancelled in 4 polling units, and total number of cancelled results stood at 2,476. Furthermore, in Umuchu community, there was a case of snatched ballot box and a formal report has been filed to this effect. Also, there were reports of failed card reader in Oyi LGA as INEC had to resort to manual voting which led to the cancellation of some results. In all however, the results were adjudged valid as Bounce News, which is on ground in Awka noted that there was jubilation at the governor's lodge, Awka.